This is a guest post by Nedim Šabić, developer of Fibratus, a tool for exploration and tracing of the Windows kernel. Unlike Linux / UNIX environments which provide a plethora of open source and native tools to instrument the user / kernel space internals, the Windows operating systems are pretty limited when it comes to diversity of tools and interfaces to perform the aforementioned tasks. Prior to Windows 7, you could use some of not so legal techniques like SSDT hooking to intercept system calls issued from the user space and do your custom pre-processing, but they are far from efficient or stable. The kernel mode driver could be helpful if it wouldn’t require a digital signature granted by Microsoft. Actually, some tools like Sysmon or Process Monitor can be helpful, but they are closed-source and don’t leave much room for extensibility or integration with external systems such as message queues, databases, endpoints, etc. Fortunately, there is still hope. Event Tracing for Windows (ETW) is the native logging infrastructure built into every major Windows subsystem. Thus, we have ETW providers that emit Ethernet frames, notifications from the USB subsystem, Active Directory logins, NTFS file system operations, just to name a few. The ETW overhead is pretty low, which makes it a perfect fit for production environments. However, the ETW API might be the one of the ugliest and the most verbose APIs ever constructed (it was publicly recognized by Microsoft). The extraction of the properties from the event buffer is truly a nightmare. The documentation is decent (if we don’t take into account the event schemas), but it lacks some more practical examples. If you go and search the Web, you won’t find any exhaustive material about ETW when looking into it from the programmer’s perspective. If we add to this the fact that there are no implementations of ETW in dynamic programming languages like Python, which is frequently used for incident response work, reverse engineering and malware analysis, those were reasons enough for giving the inception to what now is officially called Fibratus (if you’re wondering about the name, cirrus fibratus is the cloud formation type). Fibratus is a tool (inspired on Sysdig) for exploration and tracing of the Windows kernel which relies on the kernel logger provider to collect the operating system activity. It does the heavy lifting on abstracting the cumbersome details of the ETW into a consistent mechanism capable of capturing a wide spectrum of operations such as file system I/O, process/thread creation, network activity, context switch instrumentation, registry activity, and so on. On top on Fibratus you can execute filaments, which are micro modules written in Python programming language. They provide a non-intrusive model to extend Fibratus with your own arsenal of tools leveraging the goodness of the Python’s ecosystem. Because the way to interact with Fibratus is via CLI, it also uses the console as a primary sink to output the kernel’s activity to the end user. Besides that, there are a number of output adapters such as SMTP, AMQP, and the Elasticsearch adapter to send the kernel information through those respective transports. Let’s see how to setup Fibratus and configure it to aggregate the kernel event stream to Logsene – a log management service with Elasticsearch API. Sometimes, it’s interesting to spy on the specific process. To do that, use the –pid flag, providing the PID of the process. Lastly, the filaments are executed by appending the –filament option next to filament name. To enumerate the available filaments use fibratus list-filaments command. If you enable the secure transport, make sure the certifi package is installed for the certificate verification to be done properly. Now comes the funny part – the actual code of the filament responsible for sending the kernel event stream to Logsene. Let’s go through it. 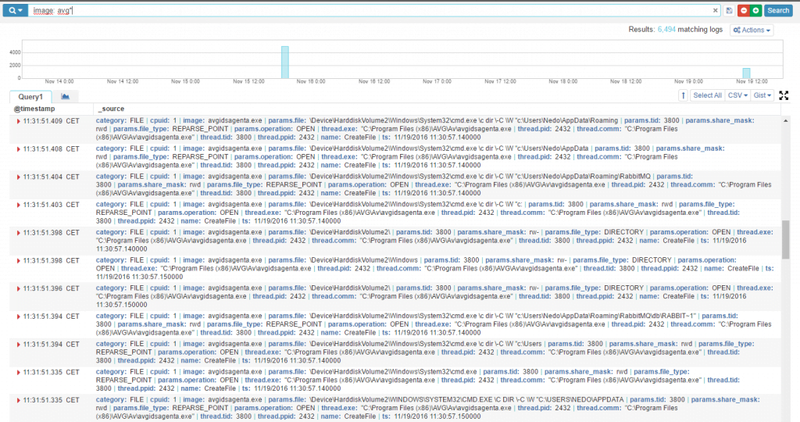 If you open your Logsene application, you should see the data stream coming, like in the figure above. Logsene comes with out of the box support for histograms and top list values. Those come very handy for finding out some basic insights about the kernel and the user space activity. For example, let’s visualize the top kernel events grouped by the event name as well as by category. The above charts give us a clear breakdown of a trace captured with Fibratus. The file system and network operations took the majority of the time in this trace. The CreateFile and the WriteFile kernel events map to NtCreateFile and NtWriteFile system calls respectively. That doesn’t mean there were 7928 file creations, though. When the user space process requests to access a file or an I/O device, it issues the NtCreateFile system call that, depending on the arguments passed, will open or create the underlying file or operate on the I/O device. To narrow down the scope of the search, we can filter by params.operation field. You can see all the files created during the duration of the trace. In my case they were various threads (note the thread.tid field) of the chrome process which created a number of temporary files, and the single-threaded sysmon process related to directories creations. We can also build a dashboard widget to observe the progression of file creations. I was curious to see what the AVG antivirus was doing on my computer. All you need to do in Logsene is to fire up the wildcard search with the image field containing the avg segment. You might expect to see a lot of file system related operations. Indeed, a large number of kernel events deal with accessing the file objects in order to find a malicious patterns. While keeping Fibratus running, the next thing I did was to launch a scan from the AVG interface. The first thing that caught my attention was a sequence of TCP packets generated by the AVG User Interface (avgui.exe) as well as AVG WatchDog Service (avgwdsvca.exe) process. Those packets were encapsulating HTTP requests to the 95.100.126.85 IP address. If you perform an IPWHOIS lookup it will reveal Akamai Technologies is behind that address. Hmm, those might be the servers from where the antivirus is pulling for updates. Next, I wanted to see the thread and the registry I/O activity. 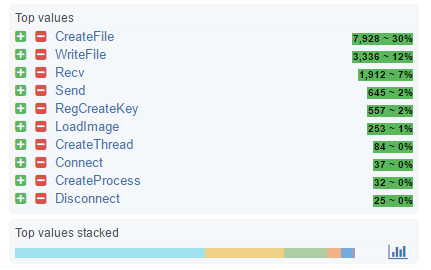 A huge number of threads were created, mostly the ones associated with the user interface processes. I didn’t find much registry activity, except the AVG Watchdog Service setting the SOFTWARE\AVG\Zen\ConfigData\ZenMainWindowOpen binary value and the avgui process trying to create the Software\Microsoft\Windows\CurrentVersion\Internet Settings\Connections registry key. We just scratched the surface of what’s possible when digging deeper into the sequence of kernel events emitted from Fibratus and combining the powerful analyzing capabilities of the Logsene platform. Sematext is a globally distributed organization that builds innovative Cloud and On Premises solutions for performance monitoring, alerting and anomaly detection (SPM), log management and analytics (Logsene), and search analytics (SSA). We also provide Search and Big Data consulting services and offer 24/7 production support for Solr and Elasticsearch.